It is a popular double-edged type of razor. Double-edged blade with two that W coated working platinum alloy and resin in the stainless cutlery steel. 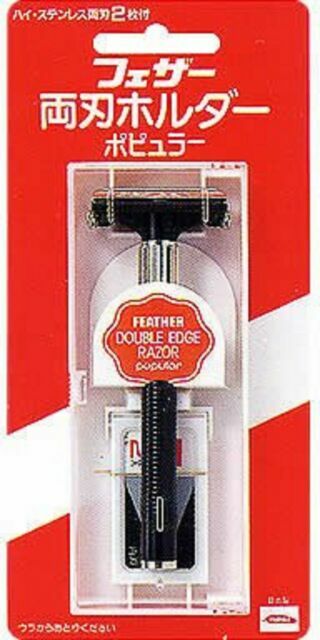 Feather Safety Razor. [ Multiple sizes and colors ]. I've been using one of these for a couple months now and like it very well. Out of dozens of double edge razors in my stash, this is my current favorite. Замечательный товар и сроки доставки! О качестве японских товаров сказано уже много хвалебных слов, и эта бритва только подтверждает это. Удивили сроки доставки -- 20 дней, куда вошли и новогодние праздники. Плюсом шел небольшой презент -- пакетик японского чая. :) Спасибо! Good DE razor for starters which a mild shave. Not Excellent but quite good. I have an old Schick Crona and was expecting this to do as well or better. It did not. The Feather MR3, however, is great. Lightweight, balanced, exellent quality, ideal for everyday use.